Sunday School started September 9, and we invite newcomers to join us at anytime. We’re taking a trip to Narnia this year, and starting off with C.S. Lewis’ book The Lion, The Witch and The Wardrobe. Lewis, through his wonderful fantasy fiction, has given us a way of learning more about God and his creation. We’re watching the Disney movie first and building a Narnia-like world in our Sunday School room. There will be discussions, crafts, and service projects taking place this year. Please join us on this fun adventure. Our class welcomes all ages. For more information, please contact Therese Chaplin at tchaplin@verizon.net. Sunday School meets in the third floor big classroom of the Main Church building from 9:15 to 10:20 am. This entry was posted in Uncategorized on September 14, 2018 by tchaplin58. In the tradition of Flat Jesus & Flat Francis, the Olivet Sunday School is announcing its Summer 2018 photo contest this year with “Flat Anna“! Anna Alexander was the first African-American Deaconess in the Episcopal Church, and she won the Golden Halo in this year’s Lent Madness tournament. You can read about her amazing life at www.lentmadness.org. Laminated cutouts of Flat Anna are available in the Simpson Room. Take one with you, and start photographing Flat Anna on your summer adventures. Email your pictures to tchaplin@verizon.net (or text to 703-969-7159). Great prizes will be awarded in several categories. Jeff Underwood has been the first to submit a photo of Flat Anna — congratulations Jeff! 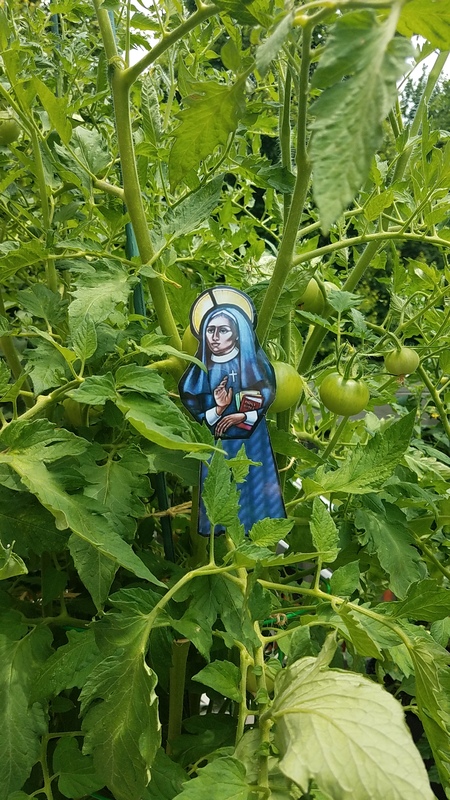 The picture below is of Flat Anna in Jeff’s summer garden. To see more of Flat Anna’s summer adventures, please check out the bulletin board in the stairway of the 1957 building. For those not familiar with our previous summer challenges, we are basing Flat Anna on Flat Stanley, a children’s book by Jeff Brown: after being flattened by a bulletin board, a young boy named Stanley makes the most of his situation by mailing himself to visit friends. Elementary school teachers throughout the years have used this children’s book in a fun project, which is to make a Flat Stanley cutout and then mail Stanley to friends and relatives, near and far. Friends and family will take photos of Flat Stanley around their town and send the pictures back to the student. The student then compiles the pictures into a book of Flat Stanley adventures. This entry was posted in Uncategorized on June 22, 2018 by tchaplin58. This entry was posted in Uncategorized on March 30, 2018 by tchaplin58. This entry was posted in Uncategorized on February 22, 2018 by tchaplin58. Is your child or teen interested in being an acolyte at Olivet Episcopal Church? Below are some great reasons to sign up for this important ministry. Please contact Therese at tchaplin@verizon.net, and she will connect your family with training to be an acolyte. This entry was posted in Uncategorized on January 11, 2018 by tchaplin58. Advent is the beautiful church season where for four weeks, we get our hearts ready to celebrate Jesus’ birth and especially remember his promise to return one day. Candle one (purple) represents hope. It is often called the prophets’ candle. Candle two (purple) represents peace. It is often called the angels’ candle. Candle three (pink) represents joy. It is often called the shepherds’ candle. Candle four (purple) represents love. It is often called the Bethlehem candle. Many Advent wreaths also include a Christ candle which is placed in the middle of the wreath, surrounded by the other four candles. The Christ candle is typically white. On Christmas Day, you light all four candles plus the Christ candle. You can easily put one together as shown in the picture: use a charger-type plate as a base, add 4 candles (you can paint the outsides of a votive candles : 3 blue/purple, 1 pink), add a center Christ candle and some greens from your yard. Come celebrate Advent with us at Olivet Episcopal Church where you will be very welcome! This entry was posted in Uncategorized on December 4, 2017 by tchaplin58. This entry was posted in Uncategorized on November 2, 2017 by tchaplin58.